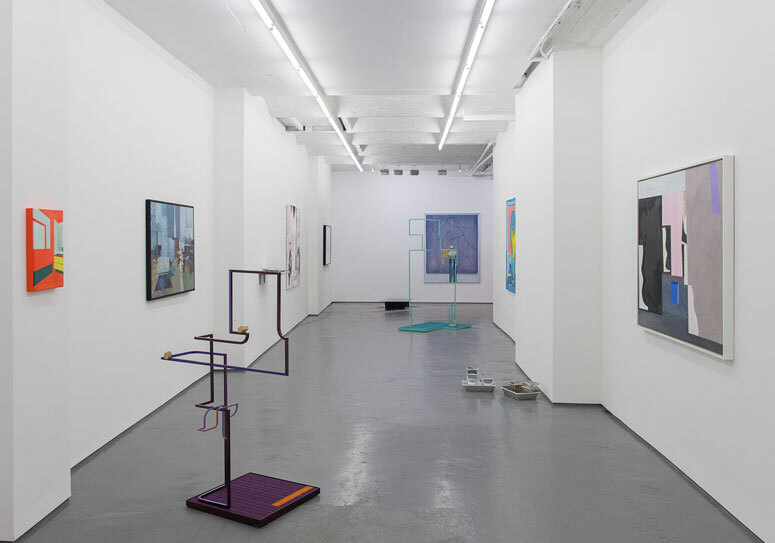 The current group show at FOLD Gallery, ‘Either Those Curtains’, draws on two literary quotes to explore artistic responses to interior space and its effect on the body and psyche of an individual. Oscar Wilde’s infamous “Either those curtains go, or I do” is married with a more philosophical musing by Haruki Murakami, “isn’t this world we live in itself like a giant model room? We come in, sit down, have a cup of tea, and when the time comes we say thank you and leave. All the furniture is fake. Even the moon hanging in the window may be made of paper.” The mixture of emerging and established artists – Dan Davis, Asmund Havsteen-Mikkelsen, Laura Bygrave, Ian Monroe, Victoria Adam, Matt Ager, Bruce McLean and Mary Wintour – consider how arrangements of interiors, or the domestic scene, illustrate personal and political values in a myriad of ways. The social construction of the individual inside their home or office is a private and therefore alternative politicised sphere. The intervention of Ian Monroe’s aluminium and carpet sculptures in the space develops an alternative materiality. Their structure, akin to a line drawing realised in three-dimensional form, allows for a new kind of encounter – able to look through them alongside looking at them. Their multifaceted physical presence is heightened by the titles of the work, personified with names such as, ‘Bella (Compliance)’ and ‘James (Accounts)’ (both 2016). The business departments of ‘Compliance’ or ‘Accounts’ is also established by Monroe’s use of the materials found in office spaces – vinyl, carpet, coloured Perspex. Work by Matt Ager and Victoria Adam, both Royal Academy graduates from 2015, similarly repurposes commonplace or domestic objects. In ‘Satintaupe Staying-In’ Adam appropriates the recognisable form of silver aluminium foil take-away boxes. The reduced scale of the work and their seductive tactile quality draws the viewer in, forcing them to bend down to investigate further, only to find small snails clinging to the sides. This fusion of desire and derision, glazed and grubbiness, is echoed by ‘Not Me But Me’ (2016), where oyster shells sit atop a scuffed steel-like shelf next to a shiny crisp packet dripping with resin. Similarly, Ager’s sculptures embody an ambiguity about the ‘high’ or ‘low’ status of materials. In ‘Land Direct’ and ‘Rockwood Grand’ (both 2016), Ager creates tables from sheets of hardened glass, balanced on cut bamboo and doormats. In ‘Made in Portugal’ (2015), a decorative ceramic asparagus leans against a wallpapered MDF structure, posturing as a shelf on a domestic wall. The mixture of Ager’s skilled craftsmanship with novelty found or bought items creates an interesting dynamic, subverting preconceptions about the hierarchy of tasteful or valuable items. Asmund Havsteen-Mikkelsen’s series of 30x40cm canvases explore the relationship between architecture and psychology. By using a small canvas and a limited palette, his use of graphic linear perspective evokes a formal and modernist sense of composition. The constrained and stripped back structures of habitation are contrasted by the mixed collage and oil paintings made by Mary Wintour. Wintour uses paint in order to edit and fuse cut and pasted images from interior design magazines. The manufactured environments and landscapes are blurred and distorted. Shadowy traces of figures can be seen through the overlaid sheets of paper, appearing like ghosts behind curtains or windows. Laura Bygrave’s two large oil paintings, ‘Ogmios’ (2015) and ‘Ancients’ (2015), straddle each end of the gallery space. By creating amplified cartoon-like figures, a hyper-real sense of corporeality is brought to the fore within the pictorial sphere. Bygrave’s cavorting characters reiterate how the interaction of a human body inside a room – the physical and psychic sense of being inside somewhere – has a bearing on our understanding of personal freedom and individuality.